The source package for 0.9.2 has just been updated with two compilation fixes for Linux users. The first fix the compilation on 64 bits systems. The second fix the compilation when using –enable-osmesa and a recent osmesa. If you’re not a Linux user, not using a 64 bits system or not interested in testing osmesa, you can safely ignore this release. This version of DeSmuME releases some odds and ends. A few new games are playable, and RTC works for day/night games. Additionally, the windows and linux ports have had a slew of new features added. And finally, the addition of a preliminary software rasterizer (which may be selected instead of opengl) will allow you to work around frustrating display issues. With this release, we have fixed a number of emulation bugs, as well as added the following features which you might be interested in: Mic, rumble, and PSG white noise. Once again we found a number of refinements to make in the GPU, for instance: blending, mosaic, affine modes; so your game might run more accurately than ever. Watch out, though–your savestates are probably invalidated once again. Sorry! This new release is the product of hundreds of new code improvements: We now have an almost 100% reworked 3D core, which is shared amongst all ports for the first time, and have better save states. Compatibility has been improved across the board. The huge number of reworked systems and small fixes is noticeable on some games and homebrew games are running better–or even running at all for the first time. And this work has not stopped, so stay tuned for what’s coming in the future! 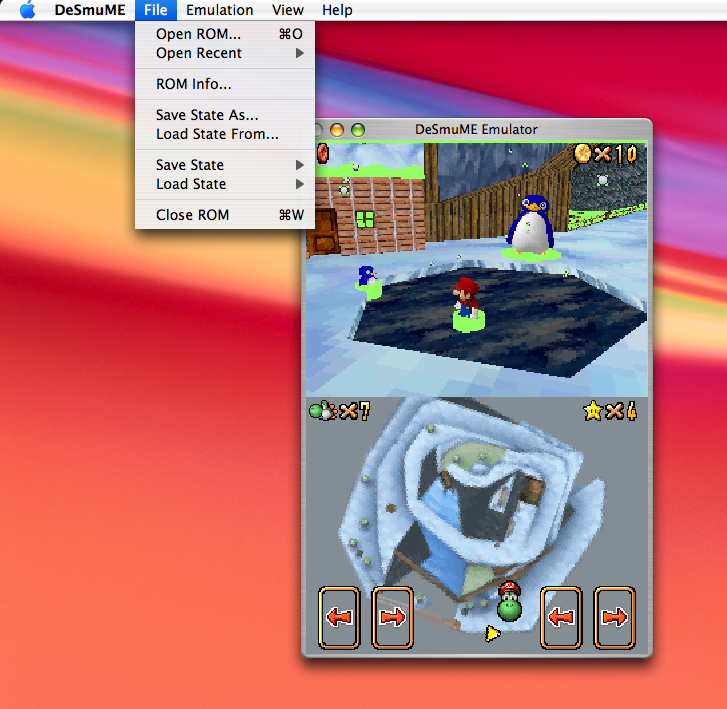 This new release fixes a number of bugs in the emulation core. preferences, screenshots and japanese translation. The Windows port has some updates as well with a new core supporting joystick. The new things in this release are a Cocoa port and translations support for Gtk-glade port. Translations are now available on three ports: Cocoa, Gtk-glade and Windows, feel free to send us new translations (there’s instructions on how to do it in README.TRANSLATION). It’s that time again. This release is primarily a bug-fix release. The new features that are included in this release though are the ability to change the firmware language and some improvements to the *nix port’s opengl code. Also those people running Mac OS X should now be able to compile and run DeSmuME pretty well now. Another month, another release. The main features for this release are the major speedup for the 2D core, a GDB debugger stub, multiple language support for windows port and a FPS limiter for the *nix ports. For now the only packages available are the source package and windows binary. The regular *nix builds will come sometime week. UPDATE: Debian 32-bit/64-bit builds are now available on the downloads page. Yes, it’s that time again. 3D emulation is the big thing for this release! Other important new features include *.duc support, sprite rotation/scaling. There was also a number of bug fixes. See the changelog file included with the packages for more details. Special thanks to snkmad who’s been doing a lot of testing for us of late. A new interface based on glade is now available and support for gzipped and zipped roms has been added.